Broad experience leading teams and producing high quality software. Received the highest performance ratings at multiple companies. Identified as a top contributor and received “Critical Talent Award” at PayPal. Selected as a future technical lead of IBM in IBM's “Fast Track” program. I've worked on the client side and on the server side. I enjoy solving problems, and helping others. I'm a mentor and educator both internally in the workplace and externally in the open source community. I'm regularly involved in local technical groups and hackathons, and was the co-organizer of a NodeSchool meetup. For examples of my work, see my GitHub projects and technical blog. Responsible for guiding the front end architecture along with mentoring junior developers. I regularly paired with engineers to assist in development, and could often be found drawing on a whiteboard to help explain difficult pieces of the system or how the team should move forward with a specific implementation. I worked with the operations team to build and deploy our applications in CI and in production, while also working alongside test teams to design our test strategy. Additionally, I worked with both the product and design teams to coordinate features and help explain development estimates. The legacy UI application had originally been developed using jQuery and Backbone, but was migrated to a React, Redux, Webpack front end. Node was used on the server side, and the legacy system utilized an older version of Express along with server side Jade rendered templates. The templates were removed in place of React views, Express was upgraded, and Node modules were introduced to share code across the applications. Led both the team and the development of the user interface for CognitiveScale. Responsible for hiring new front end engineers, along with mentoring and leading the front end team. Held daily standups and retrospectives which included the design team as well, as we tried to integrate the efforts of both front end and design. Responsible for working with the product and business teams to break down customer requirements into work items for the front end team. The UI was often web based, but some use cases required a native device application (iOS). The front end web technology was a mix of React, Redux, Webpack, and Babel, along with React Native in some experimental native development. Node.js was used to power the server side of the UI, utilizing Express for APIs and Mongo for storage. In earlier iterations, the front end used Angular, and in the native device case, a combination of Ionic and Angular. Assisted the developer operations team on deployment of the Node.js applications, as well as production support for CognitiveScale applications. Helped build documentation and training around the use of CognitiveScale for customer sessions. Co-organizer, mentor, and frequent presenter of Austin NodeSchool. Helped build the Austin NodeSchool presence using the available open source community tools and encouraged others to help with this effort. Presented multiple workshops at events and helped answer questions outside the hosted events. 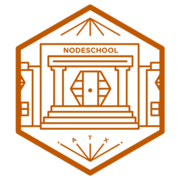 More information can be found at Austin NodeSchool. Volunteer for the MakerSquare mentor program. MakerSquare provides a three-month course for students who are interested in transitioning to a software engineering career. I often was paired with a student for me to mentor outside of class. I met with each of these students on a weekly basis and, during these meetings, helped with course material, answered questions, reviewed the student's resume, and provided advice about the industry. Analyzed internal bride data, and helped design a vendor app that provides vendors with a better understanding of their customers. Prototyped data endpoints and developed an Apple push notification service for the app. Setup an internal npm registry for internal Node.js packages, and helped developer operations design automation to deploy Node.js to production. Researched price data available, and developed APIs useful in prototyping a mobile app experience around displaying the price of wedding related products for consumers. The APIs were developed in Node.js, using Express, and utilized Mongo as the backend database. Passport security was integrated to allow user profiles in the mobile app. Developed an e-commerce marketplace platform to provide TheKnot vendors an ability to sell to the general public. The APIs were developed in Java/Spring, and utilized Spring Security. Designed and developed an admin interface to this system using Backbone.js, and used Node.js to both serve up the UI and test the backend APIs. Setup a Jenkins continuous integration server to run nightly builds and deploy to an AWS EC2 environment. Worked on the PayPal Identity program, providing support to customers who wish to use PayPal to identify themselves to third party merchant web sites. As part of the first eBay development team in Austin, helped in the transition of a large, legacy Java web application (the Resolution Center) hosted on the eBay website. Continually involved in design, architecture, and planning of future work by aligning with the business, reaching out to external teams, and resource planning for FY2012/13 deliverables. Senior developer on web application infrastructure framework (Sparta). Developed, led and maintained code used by PayPal to host Java based applications running the PayPal website. Architected and developed multiple Java based projects glued together with Maven, utilizing Spring for core configuration and web flow. Designed and implemented Eclipse based plugins used by developers to build applications and add individual web pages to existing projects. Lead technical developer on PayPal’s Digital Goods Express Checkout application, the first PayPal web flow to use “Remember Me” authentication. Led education sessions across the company on how to use Java, Spring, Maven, Eclipse, and Sparta based applications in general. Created, designed, and implemented a Java based automation framework used by teams across PayPal. Led an effort to migrate testing to this Java based framework, gave presentations on its need and benefits to executive level management while leading educational sessions across the company. Acquired a proficiency in Web Services policy set framework and administrative console, in addition to Web Services Security internals and caching solutions. Designed and implemented many features in Web Services, including schema definitions, working with JAXB generated objects, policy interactions, security role definitions, and multiple admin tasks. Developed Web Services Security functions. This required an understanding of internal caching mechanisms and an expansion upon those using MBean and JDBC/Database solutions. Created and led a WebSphere Console automation team using the GUI automation framework I designed and developed the previous year. Designed automation harnesses to test Web Services Policy Set features, Jython admin commands, Web Services Security, and general service and client Web Services application. Began career manually testing the security panels of WebSphere Console (web interface), and found that moving the test team to a GUI automation solution would greatly increase efficiency of testing. Led a team developing a framework using Rational Functional Tester (RFT, an Eclipse based tool formally known as XDE) to test the WebSphere Console. As more WebSphere Console FVT teams merged in, the framework was broadened to support the multiple users. The framework is currently in production today, and has led to patent submissions. Led an RFT focused GUI Automation Community consisting of many members across IBM worldwide. Became technical team lead for WebSphere Functional Verification Test (FVT) automation project using Rational XDE/Robot GUI automation tool. FVT for Network Authentication Service (IBM’s Kerberos security product). System Verification Test (SVT) for DCE and Network Authentication Service.